I have been making Lemon Bars for years. Normally I bake them in an 8 inch (20 cm) pan, but there are times when I need a larger amount. And that is when I make this recipe, as it uses a 9 x 13 inch (23 x 33 cm) pan. Like my other Lemon Bar recipe, these Lemon Shortbread Bars combine a buttery crisp shortbread crust with a tart and tangy lemon filling. However, for this recipe the lemon filling is about twice as thick. I love how the lemon filling separates as it bakes. The top layer has a thin cake-like crust, while underneath the lemon filling is all soft and creamy. 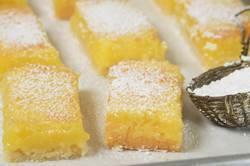 Lemon Bars (some called them Lemon Squares or Lemon Slices) are instantly recognizable because of their liberal coating of snowy white confectioners (powdered or icing) sugar. The day these bars are made you will find the shortbread crust is crisp and the lemon filling is tart and tangy. But if you store them in the refrigerator overnight, you will find that the shortbread's texture softens and the lemon flavor has mellowed. Perfect either way. In order for these Lemon Bars to have a nice citrus flavor, you need to use fresh lemons, not the imitation lemon juice that comes in a bottle. When choosing lemons make sure to look for ones that are fragrant with bright yellow skins. They should be firm, plump, and heavy for their size. Try to avoid lemons that have blemishes, soft spots, green spots, or are hard and wrinkled. Lemons consist of a yellow outer rind (skin) that contains the fruit's oils and perfumes. This outer rind, of varying thickness and graininess, can have either a bumpy or smooth glossy texture that contains most of the lemon's wonderful tangy flavor. Before removing the outer rind (zest) make sure you wash the lemon thoroughly (soap and water is best). The rind (zest) can be removed using a knife, vegetable peeler, grater or zester. Inside the outer rind is a white membrane (pith) that is very bitter and should not be used as it is inedible. Small vessels called 'pulp vesicles' make up the inside of the lemon and contain the pleasantly acidic lemon juice and seeds. Squeezing the lemon by hand or with a lemon squeezer or reamer releases this clear tart juice. Lemon Filling: In a bowl rub the lemon zest into the sugar. Stir in the flour and salt. In another large bowl, whisk the eggs. Gradually whisk in the sugar mixture until smooth. Add the lemon juice and stir to combine. Pour the filling over the shortbread crust and bake for about 25 - 30 minutes, or just until the filling has set. Remove from oven and place on a wire rack to cool completely. TIP: Always remove the zest first before halving and squeezing the lemon. Use a fine strainer to remove the seeds and pulp from the juice.